The Derbyan Parakeet, Psittacula derbiana is endemic to Southeastern Tibet, northeastern India and southwestern China; and is now confined to small pockets of moist evergreen forest in the hills of the Indian state of Arunachal Pradesh and the Chinese province on its border. This species suffers from poaching for the illegal wildlife trade and fetches a high price in the black market. It is perhaps the rarest of all species of Psittacula in mainland Asia. Their natural diet consists of fruits, berries, seeds and leaf buds. 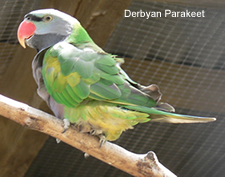 The Derbyan Parakeet is larger than most parakeets. Adult Derbyans average 20 inches (50 centimeters). It is said to be similar in size to the popular Alexandrine Parakeet. These birds are sexually dimorphic, meaning that males and females may be distinguished visually. The plumage is green with black lower cheeks and lores (the regions between the eyes and bill on the side of a bird's head). Parts of their thighs and wing covets are a mauve to slightly grey-blue and they have striking violet blue heads. Males have a red upper beak, while the females have an entirely black beak. They have pale yellow eyes and grey feet. The female may also be distinguished from the male by the presence of a brown band behind the ear-coverts. Her abdomen plumage is, slightly paler and she has a black upper beak. Immature Derbyan Parakeets are easily distinguished from adults because they have green crowns and napes, upper and lower beak in both males and females are pink. Additionally, their irises are dark, and do not get light until they reach maturity. Young males have a slightly paler abdomen plumage. Adult plumage is attained by two years. The Derbyan Parakeet is a popular pet because of its wonderful colored plumage, its intelligence and its excellent talking abilities, which differentiates it from other Asiatic Parakeets, who usually don't have the clarity of voice. Even though the Derbyans don't have the ability to learn an extensive vocabulary, the way they speak resembles the speech of the Amazon Parrots. This being said, there never are any guarantees that a Derbyan Parrot will learn to talk, but most do - even the females. This is a very intelligent parrot that needs plenty of stimulation. It loves to chew and can be quite destructive, providing your Derbian with a variety of chew toys will inhibit destructive behavior. Additionally, they should be given a large number of toys, to help prevent boredom. The Derbyan Parrot is also popular among aviculturists for several reasons, including its striking plumage, its ease of breeding and excellent parenting skills. The Derbyan Parakeet reaches sexual maturity between 2 and 3 years of age. It has been reported that they may reach sexual maturity later in the wild, possibly as late as 5 years. The Derbyan Parakeet makes an excellent parent and breeds readily in captivity. The typical breeding season will begin in April or June and clutch sizes average 2 - 4 eggs. The incubation period lasts for 23 - 28 days, and chicks fledge at 8 to 9 weeks of age. The Derbyan should either be kept in an aviary, or in a cage with plenty of supervised "out-of-cage" time. Derbyan's are social animals and like to be "part of a flock" -- which could be a group of birds in an aviary setting or a loving human family. Regular handling / plenty of interaction is required to maintain your Derbyan's tameness. Derbyan's are naturally shy of the human touch and are generally considered placid when compared to some other parakeets. Derbyan Parakeets that are kept outdoors may require regular worming -- as they spend considerable time on the bottom of their aviaries or cages. Because of this habit, they are also susceptible to fungal infections. Good sanitation is particularly important for anyone keeping this parrot.